As promised we are back with update on Purvita's garden. 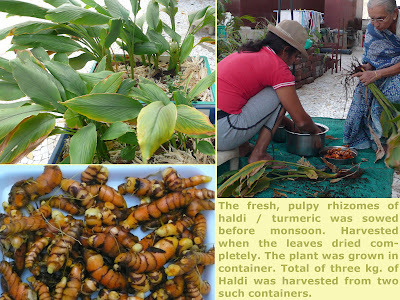 "A whole lot of reviews on my terrace garden last time made me nervous.... I wondered, how I would ever manage to keep up to the expectations. Well after a big pause, I told myself, “what the heck, let me update the readers, forget what is expected!" This is what I have done and would like to share. Here are the pictures which are self explanatory, enjoy!" More later... feel free to comment and most welcome to visit my terrace. Have made more of Amrut Mitti in containers and doubled the space with plantation. Wish to land a helping hand....??? pl contact. Promise to reward you with a sapling in return. Currently have sowed seeds of tomatoes, chillies, capsicums, variety of brinjals, bindi etc.... hoping the summer will be as good as ever, for us to have a bounty crop this season too.